Pell Grants are essential to ensuring that UC remains affordable for all eligible Californians. 40 percent of UC undergraduates – roughly 80,000 students in all – receive Pell Grants. UC has the highest percentage of students receiving Pell Grants of any top research university in the country. Year-round Pell Grants would help an estimated 1 million students around the country graduate from college more quickly. As lawmakers look to finalize a federal spending bill for fiscal year 2017, college students should pay attention: Congress could consider restoring year-round Pell Grants. The Obama Administration has proposed providing additional grant aid to students who complete a full-time course load during the academic year. The idea is to help students cover the cost of summer session classes so they can earn a degree more quickly. 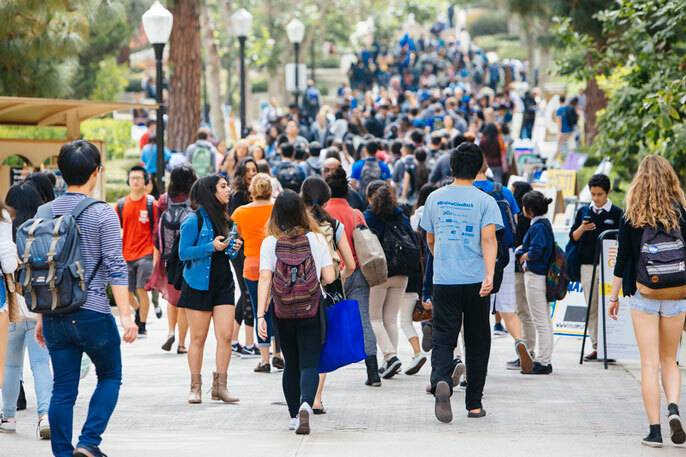 At the University of California, where roughly 40 percent of undergrads receive Pell Grants, restoring year-round aid could help thousands of students get through college faster and at a lower cost, said Gary Falle, UC’s associate vice president for Federal Government Relations. The grants, which are a cornerstone of federal financial aid, currently provide up to $5,775 in annual need-based aid to students from low-income families. Unlike loans, they do not need to be paid back. Both UC officials and student leaders have been pressing lawmakers to restore year-round Pell Grants. UC Student Association (UCSA) members traveled to Washington three times over the past year to make the case. The extended aid would go beyond helping low-income students earn a degree more quickly, he said. It would enhance overall financial stability for students amid rising costs for housing, food, books and transportation. “The absence of year-round Pell grants has influenced completion rates for low-income students,” Washington Jr. said. Year-round Pell Grants were first approved in 2008 as a supplement for eligible students who had exhausted their academic-year aid. The program was cut in 2011 in response to rising costs and the deep national recession. The Congressional Budget Office now projects that the $30 billion Pell Grant program has a surplus, opening the possibility for the program’s restoration. An estimated one million students around the country would benefit if year-round Pell grants are restored, according to Senator Lamar Alexander, R-Tenn., who chairs the Senate Committee on Health, Education, Labor and Pensions. “This will be the most important news for college students out of Congress this year,” Alexander said in a statement earlier this summer. At UC, restoration of Pell Grants would be particularly significant. UC enrolls a higher percentage of low-income students than any other research university in the country. Pell recipients graduate at nearly the same rate as all other students, but take longer, on average, to complete their degrees. The extra financial aid would help students save both time and money, Falle said, and improve graduation rates among low-income students. And to the extent that students are graduating more quickly, UC and other universities would have room to enroll more students. Applications to UC have gone up every year for a dozen years, making it tough to keep up with demand, he said.